Johann Bernard Schwertfeger was born on November 12, 1880, in Lagschau, about 40 km south of Danzig, West Prussia. The village is now Łaguszewo, located about 40 km south of Gdansk, Poland. Johann was baptized on November 14, 1880, probably by the Catholic priest from nearby Kladau. 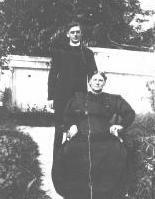 To our knowledge, Johann was the first surviving child of Franz Carl and Julianna (née Schlia) Schwertfeger. 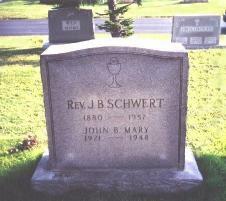 Johann's name was anglicized to "John Bernard Schwert" upon the family's emigration to the United States in April, 1881. Johann was, of course, an infant when he arrived in the United States. 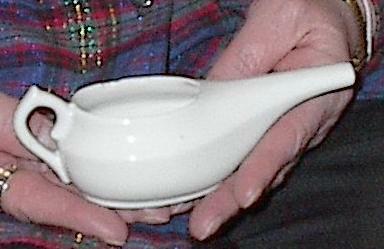 One of the few artifacts of this journey is a small pitcher (Schnabeltasse) used by Franz and Julianna to feed their infant boy. The family settled in Buffalo, New York. There, Johann attended Saint Boniface School and evening public school. 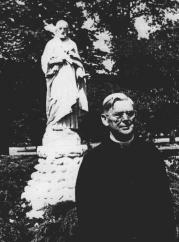 In September, 1906, he entered the Saint Josephite Seminary in Baltimore, received tonsure in June, 1908, and was ordained in Baltimore on June 21, 1911, by James Cardinal Gibbons. "Rev. 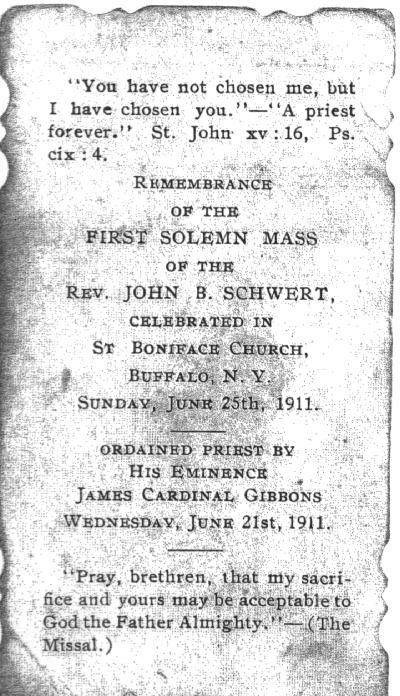 John B. Schwert" celebrated his first solemn mass on June 25, 1911, at Saint Boniface Roman Catholic Church in Buffalo, NY. 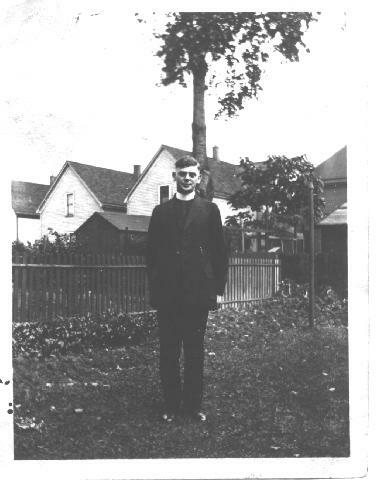 In 1924, due both to failing health and the needs of his parents, Rev. John returned to Buffalo. There, he became a secular priest. 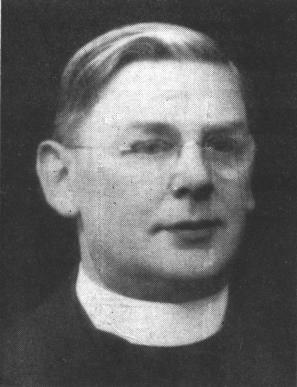 On June 27, 1936, Rev. 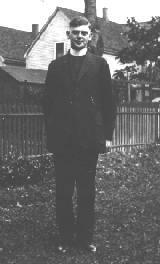 John was appointed as chaplain at Sisters of Charity Hospital in Buffalo, where he had living quarters and put on many miles up and down the hallways tending to the patients' spiritual needs and getting up at all hours of the night to give the "last rites" when one was dying. He also served as chaplain of Saint Mary's Maternity. Rev. 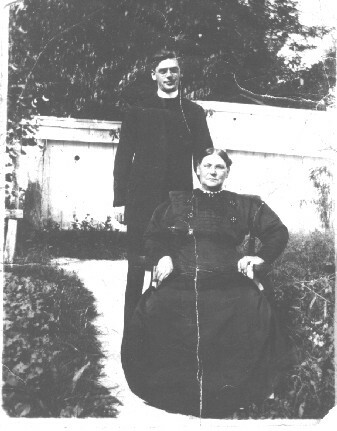 John was very close to his family, especially his sister Martha (née Schwert) Mary. He helped her husband, Edward, and her son, John get jobs at Sisters Hospital. During the Depression and World War II, he helped out with food (fruit and vegetables, by the bushel) and even assisted with the canning. Every Wednesday and Sunday, Edward and Martha would pick Rev. John up and play cards all day. Rev. John was a very serious pinochle player (he couldn't talk or visit during the games). He liked his cigars, and Martha would fix his favorite dishes: potato pancakes with homemade applesauce and (sometimes) limburger cheese sandwiches. When Rev. John sat down, he would cover his lap with a newspaper because he had some kind of growth, which as later removed by surgery at Sisters Hospital. Rev. John is remembered as a caring, giving person. He never kept anything for himself; he never even had his chalice engraved. Most of the money that Rev. John made (from weddings, funerals, masses, and baptisms) he used to put 27 young men through the priesthood, through the propagation of faith. (Included were Bishop Paul Taguchi from Osaka, Japan, and Cardinal Maurice Otunga from Nairobi, Kenya, who was once considered for Pope). Rev. John suffered a cerebral hemorrhage and died on August 23, 1957, at the age of 76. Bishop Joseph A. Burke offered a Pontifical Requiem Mass at Saint Vincent de Paul Church. Rev. John is interred in Lot 250, Section D, at Mt. 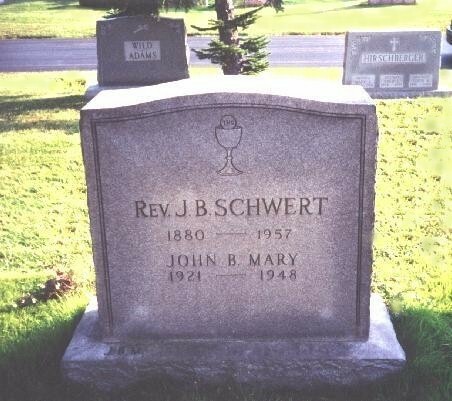 Calvary Cemetery (Pine Hill), Cheektowaga, NY, alongside Martha, Edward, John, and Grace Mary. Rev. John's chalice and religious items were donated and used at the Buffalo Diocesan Museum. They were later given to a young, needy priest (name not known). Text written by Olive Mammoser, niece of Rev. John Bernard Schwert. Rev. 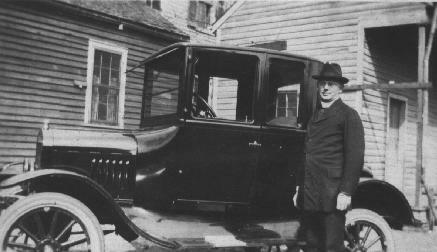 John Bernard Schwert, with his car. Rev. 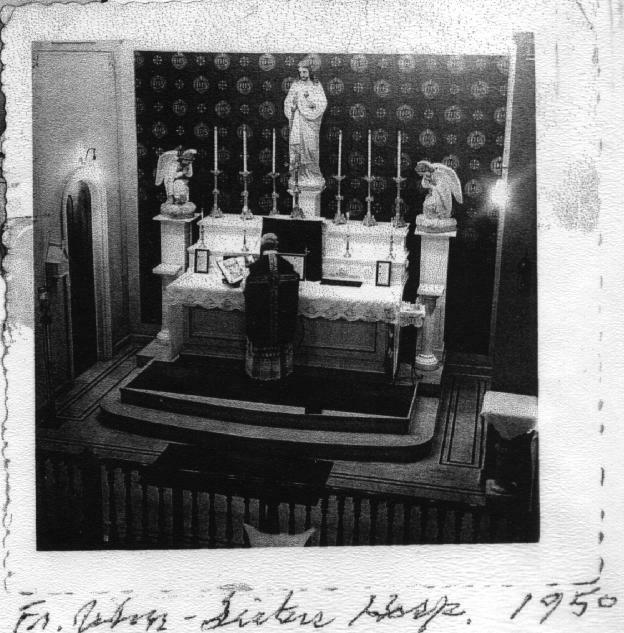 John Bernard Schwert, celebrating mass at Sisters Hospital, Buffalo, NY (1950). Rev. 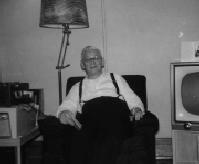 John Bernard Schwert, 1953 or 1954. Franz Carl Schwertfeger / Schwert: Born 1852; died 1932. Julianna (née Schlia / Schlee) Schwertfeger / Schwert: Born 1854; died 1938. Grave of Rev. John Schwert, Mt. Calvary Cemetery, Lot 250, Section D, Cheektowaga, NY. 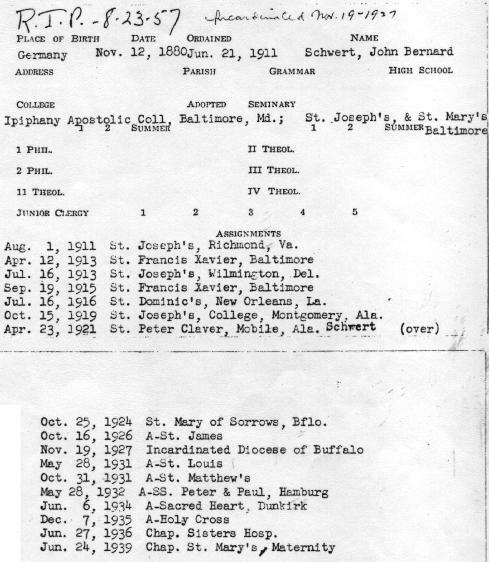 Josephite Seminary, Baltimore, MD: Records for Rev. John B. Schwert, giving his birthplace as "Lackshau, Prussia, Germany." His birthplace was actually Lagschau, West Prussia --- now Łaguszewo, Poland. 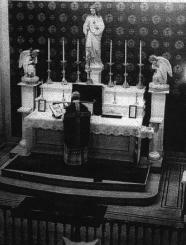 First Mass: Remembrance card for the first mass of Rev. 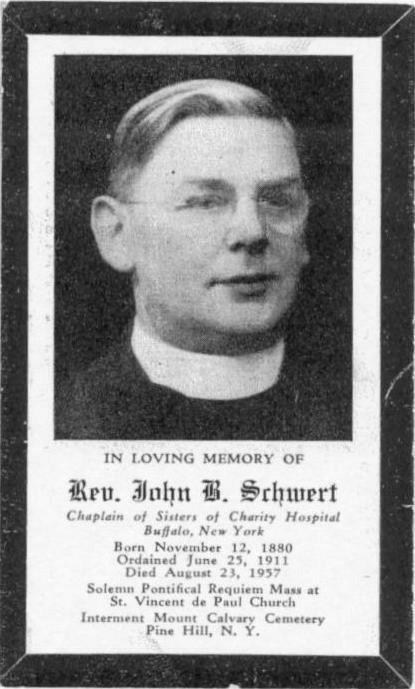 John B. Schwert, June 25, 1911. Chancery Records: Diocese of Buffalo, Rev. John B. Schwert. Obituary: Rev. 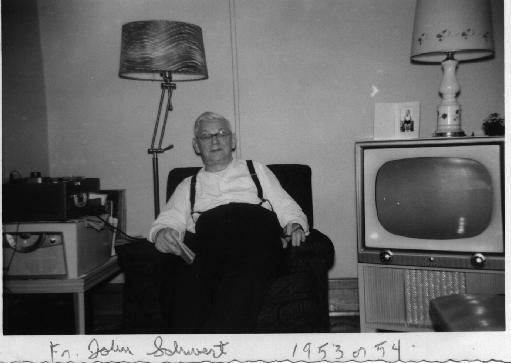 John B. Schwert, August 23, 1957. Mass Card: Funeral of Rev. John B. Schwert. 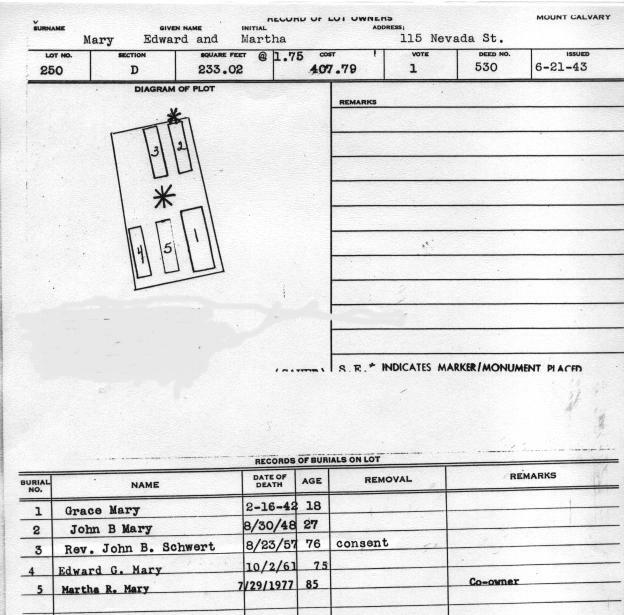 Cemetery Lot: Official lot record from Mount Calvary Cemetery, Cheektowaga, NY, for Rev. John B. Schwert. Schwertfamily.net is maintained by Donald P. Schwert, great great grandson of Carl and Veronica (née Modrzejewska) Schwertfeger (Schwert). We seek your assistance in helping us to develop this family history. Correspondence can be mailed to: Donald P. Schwert, 300 Broadway N #204, Fargo, ND, 58102-4720 U.S.A.